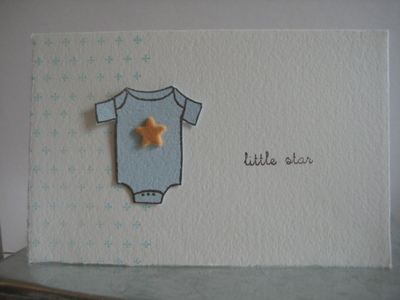 It's probably not easy to see in this picture but I stamped our onsie on light blue paper that has a weave to it so it gives the appearance of fabric on the card. Then I cut it out using detailed scissors and glued it to a Fabriano card. Next, I used star shaped velvet brads from Making Memories for the front of the onsie. These brads are beautiful and the packet has a nice selection of colors.